Home | Projects | Go Tell It at the Quilt Show! “Go Tell It at the Quilt Show!” is a Quilt Alliance project designed to capture the stories of quilts where quiltmakers gather. 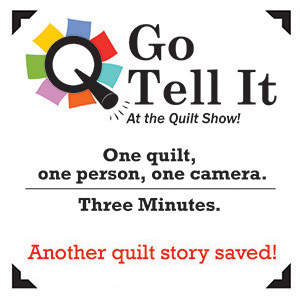 The formula for “Go Tell It!” is simple: one person talking about one quilt in front of one camera for three minutes–another quilt story shared! Anyone can do a Go Tell It! interview: quiltmakers, quilt appreciators, recipients of quilts, quilt collectors, curators or historians. We’re saving these quilts’ stories, three minutes at a time! Watch any of our Go Tell Its! below, recorded at the events—quilt shows, galleries, and museums—where quiltmakers and quilt enthusiasts gather. Go Tell Your Quilt Story! Make your own Go Tell It at the Quilt Show! video with any quilt you love, and we’ll add it to our gallery of quilt stories. If you’d like to learn to save quilt stories three minutes at a time with your guild or community, contact us for more information.